Maksym obtained his PhD in 2013 from the University of Sheffield in Physics and then received EPSRC Doctoral Prize Fellowship to continue his research. His main research interests in Physics are non-linear and quantum polariton phenomena in semiconductor microcavities and polariton solitons and pattern formation in polariton systems. Maksym is the editor in chief of The Polariton Times. He is also interested in quantum information processing. For his work on bright polariton solitons he was awarded the Young Scientist Best Paper Award at the International Conference on Physics of Semiconductors in 2012. He was also shortlisted for the Cavendish Medal at 2013 SET for Britain. In 2014 he received Santander Research Mobility Award. Maksym was Impact Champion of the LDSD group from 2015 to 2018. He was actively involved in coordinating the group’s outreach activities, such as the Summer Science Exhibition 2015 at the Royal Society and the Cheltenham Science Festival 2017, and is directing the production of educational animations (YouTube). 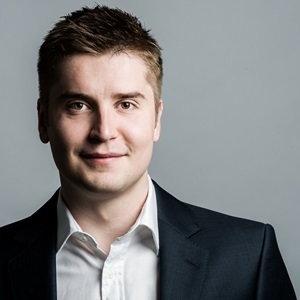 Maksym also holds BSc in Economics and Finance from the London School of Economics and Political Science and is interested in science policy. He is a contributing author at The Conversation and VoxUkraine think tank. See Maksym’s contributions at GitHub and MATLAB Central.